Well summer is over! I ended up doing my internship at Caterpillar and had a delightful time! I especially loved the cafe there! The D11, D7E, and 735 articulated truck were cool too. I really hope to post some more how-to guides probably related to RF modules… I’ve been working with some ultra low cost RF modules from sparkfun and just starting to do some work with XBees after an awesome donation! I have around 60 pro/standard series 1/prototype (mostly standard) xbee modules! I just haven’t had the time to write about many of my other projects. 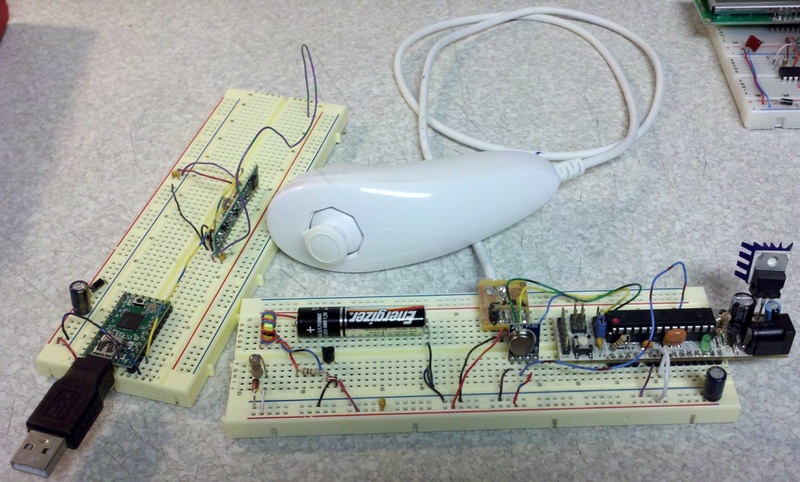 Here’s a wireless wii nunchuck mouse, and it uses a 5v limited joule theif for the power supply. This is great since it runs down to 1v. The receiver acts as a HID device with basic error detection and those low end modules are only a one way link, so it would just throw out the reading if any error was calculated.